Hey! Great looking mod! 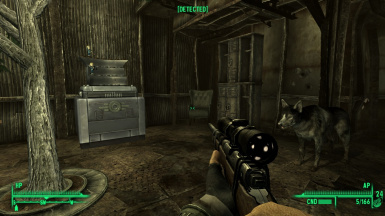 I have a problem though, the scope in the rifle looks off. Something is wrong. I have the Archive Invalidation fix, so I don't know what might be the issue affecting the textures. Any info? Not that I can think of. What is the problem? I had texture issues with the older versions, but I believe I fixed them all. But if you describe the problem to me, I can sure look into it. Also, thank you! Hello, i too have the same problem it seems. The scope looks orange with no textures on it. Tried switching off other mods and activating again to see if there's a collision but no. It seems a standalone issue or we are doing something wrong? Where can i find it in Temmpenny´s house? Didn't even think of that! I can try to do an update adding the gun to both houses. Haven't touched this mod in forever, I'll check and see if I still have all my old files. 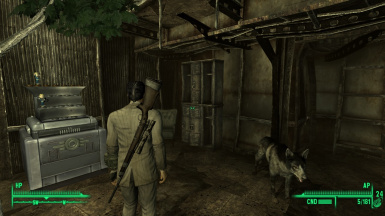 I added it to the Tenpenny Suite, it's right by the door in the corner with some ammo. Could you reply back to this message when you've tested it? I need to be sure nothing else got changed. No idea, haven't modded in forever. But why do you want the ID? The gun is on the desk. 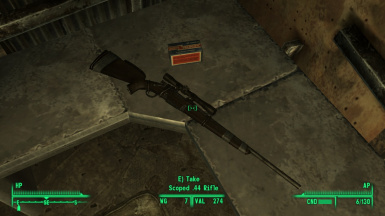 I am assuming from the shots this weapon can be found in the player home? You could, at least, create meshes, textures and sound directories. Even so, the user has to guess the proper mesh paths or use FO3Edit to determine them. Not sure the mod is worth the effort. I figured that out in school, sorry. I'm posting one with correct file paths tonight/ really soon! Ok it is fixed. It will work correctly now, all paths are set.